This function of PDFCool Studio gives the user advanced tools to copy pages from existing PDFs and re-use them to assemble several new documents. 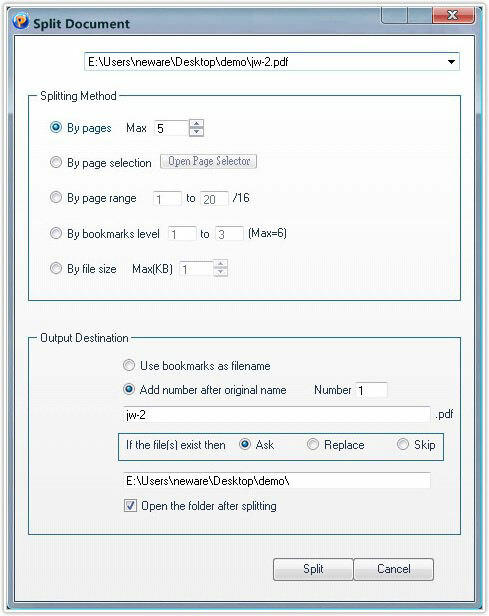 The user can split PDF document based on bookmarks. For instance, a PDF document has the bookmarks up to level 3, and it has 5 nodes on level 2. 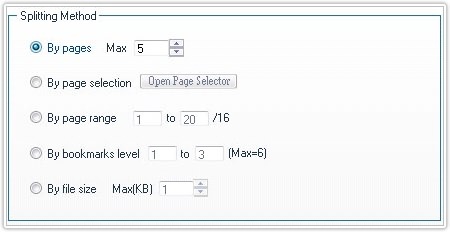 In this case, If you choose to split by bookmarks level 2 to 3, then 5 new PDF documents will be created, each document has the pages from level 2 to 3 of each nodes on level 2. Use this method to split the document into equal size documents of a given size of documents. Click on the up and down button or enter the document size directly. Set the output file name: The user has 3 methods to set the output file name: a. Use bookmarks as filename; b. Add number after original name; c. Enter the output file name by hand. Set the Output folder: Choosing output path by click or enter the output folder directly.